Last Friday night Duncan Real Estate was honored with a Chamber Business Award 2019 by the Anna Maria Island Chamber of Commerce. During the yearly Award Ceremony and Board of Directors Installation at the Seafood Shack four Business Awards were presented. There were awards given in four categories for small, medium and large business of the year and including the new “Non Profit of the Year”. 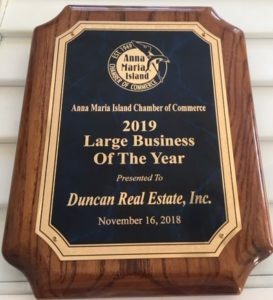 Additionally, the Rotary Club of Anna Maria Island co-directors Judy Rup and Dennis Schuermann awarded the Rotary Club’s Businessperson of the Year award to John Horne, the Anna Maria Oyster Bar owner. 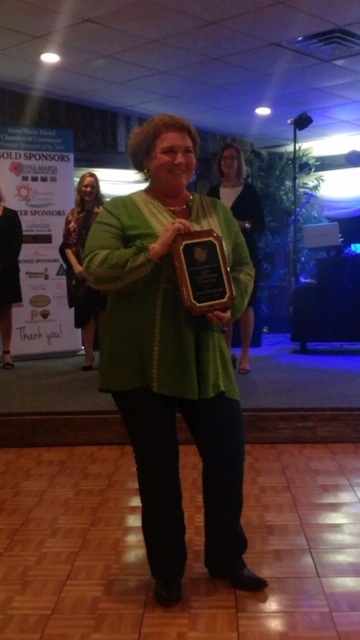 Chamber Board member Karen LaPensee awarded Darcie Duncan with the large Business Award. Darcie’s experience in Real Estate for more than 2 decades shows proven results with her exceptional real estate service. As a strong leader she built a positive working environment and is supporting and nurturing those around her. Growing by building client relationships she provides above industry standards in times of constant change with the necessary dose of optimism that conveys the strength and security of the business. Support PACE Center for Girls, Woman’s Resource Center of Manatee County, Suncoast Reading, Manatee County Education Foundation, The Center of AMI, AMICCO, Art Hop, AMI Players, Foundation for Dreams, American Cancer Society, Manatee Players, Red Cross, St Jude, Bradenton Christian School, Good Will, Humane Society. Please call Team Duncan for all your Real Estate and Vacation Rentals needs at 941 779 0304 or send us a quick message.